A street vendor's cooler of marcianos in Huanchaco, Peru, where it is always summer. Here it is! April 26th and the thermostat in Austin, Texas crossed the 90 degree mark all afternoon. I know that people with a calendar in front of them or those who pay attention to the tilt of the Earth might disagree, but I am ready to officially declare summer. May the rainfall be average and the season end before October. One of my strategies for enjoying summer is to make sure that I have plenty of cool hydrating food and drinks on hand. 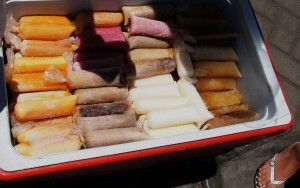 In Peru unchurned ice creams and frozen fruit juices are very popular year round. These treats, known as marcianos, are usually produced in homes and sold directly out the front door or in coolers around town. Pretty much any fruit can be used to make marcianos, but the most popular appeared to be coconut, maracuya (passion fruit), and strawberry. To celebrate the beginning of summer we made our own Maracuy y Fresa Marcianos using passion fruit yogurt and fresh strawberries. They are a delicious and healthy way to break in a new popsicle mold and cool off, if only for a little while.